View of the palace of Aigai (photo: AMNA/A. Kottaridi). 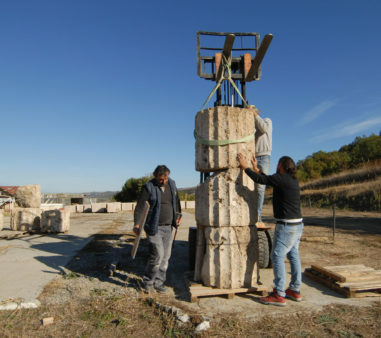 A piece of limestone hewn with skill and care was greeted with enthusiasm a few days ago at the archaeological site of Aigai, in Vergina. Its carving had been completed by expert craftsmen who had managed to give it shape and form and to place it between two ancient drums from the columns of the palace being restored. The sample was considered to be extremely successful and this is quite promising for the future, since several such drums are expected to be carved over the next few years, so as to complete and restore approximately 30 columns of the peristylium, the porticos on the facade, the polystyles of the antechambers and the imposing building that had been described by professor Wolfram Hoepfner as the “Parthenon of Macedonia”. At the same time, approximately 7,000 stone plinths started being made, measuring around 1 metre in length, 0.50 m in height and 60-70 cm in width, to be used with their ancient preserved counterparts in the reconstruction of the enormous base on which the monument is mounted. The craftsmen shape the surfaces of all these stones by hand and the tools correspond to the ones used in antiquity. At this spot in Vergina, on the elevated part of the slope where the palace was built in the times of Philip II, once the weather has improved in early May, the famous mosaics of the kores and the flowers will be uncovered as will the abduction of Europa, for the site to be opened to the public, once the issues are settled related to circulation on the narrow, uphill road. There the visitor will be able to see a substantial, already reconstructed part of the monument, as well as the very interesting works of restoration. “Whoever comes to the palace, can now see the building.The maximum height of the reconstruction is 1.6 metres” explains archaeologist Angeliki Kottaridi, head of the Ephorate of Antiquities of Hemathia, to the Athens and Macedonian News Agency. As she points out, so far, the conservation and reconstruction have been completed of the west, south and south east wing, where the rooms with the mosaics are located, while the ancient floors have been preserved and next the restoration will go ahead of the columns of the façade on the south stoa and the peristyle. “In the end we will have the south part of the peristyle restored with 16 columns and the frieze at a height of eight metres. Thus, for the first time a complete image of the building will emerge, which is representative of classical architecture in Macedonia with its straight columns and architrave” she adds. Moreover, she describes as positive the fact that the budget for restoration works on the palace was doubled at the end of last year by the Operational Programme “Competiveness, Entrepreneurship and Innovation” of the NSRF, reaching a total of 10 million Euros ,with the time horizon for the works termination being the end of 2022, bringing the current period to a close. “This means that apart from the restoration of the peristyle, the whole of the north side of the palace will be reconstructed with the enormous retaining wall; the great technical work done by the ancient Macedonians and which has to be completed by us so as to retain the sliding slope,” she points out. According to Mrs Kottaridi, the restoration of the palace of Aigai is extremely important, because it will offer Macedonia the most significant example of architecture of the Classical era existing throughout the whole of northern Greece. 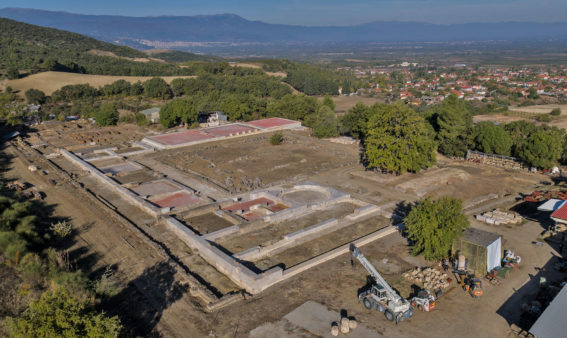 “The palace of Philip II was destroyed in the mid 2nd century BC, after the conquest of Macedonia by the Romans and many of its stone architectural members became construction material for other buildings. 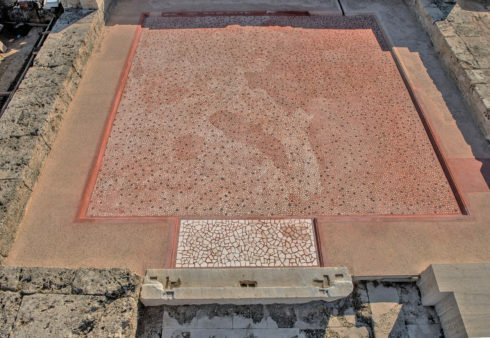 It is characteristic that many of the stones from the part of the building unearthed by the excavation of the French in the 19th century were used to build the houses in the neighbouring refugee village of Vergina” she pointedly notes. 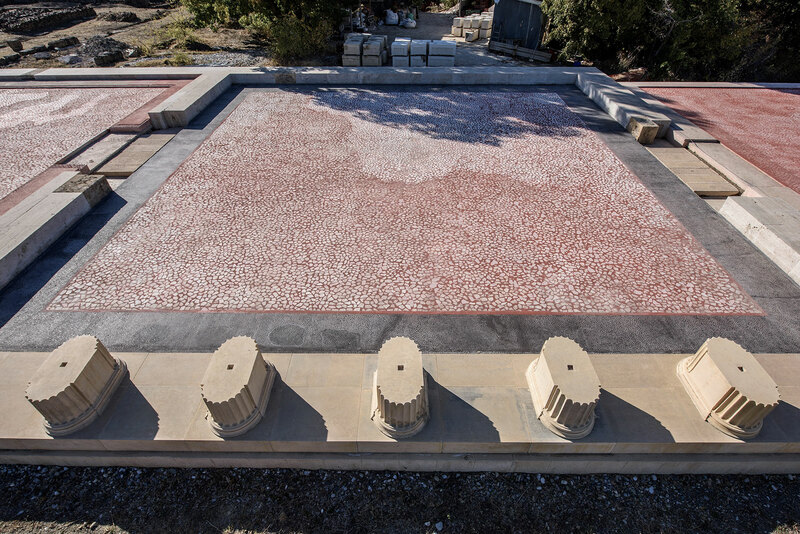 Meanwhile, the upper floor of the facade of the palace’s propylon along with a part of the galleries’ colonnade, 30 metres long and 8 metres high, have been reconstructed inside the new museum of Aigai. This exhibit, corresponding to the reconstructed propylon of the Miletus agora in the Berlin Museum, was chosen to be placed in the museum as it could not be restored in situ for static reasons. Regarding the museum itself, it can function for events and educational programmes, but the change of procurement and tendering legislation caused delays of several months till the various systems adapted themselves Given the delays and the required procedures, Mrs Kottaridi estimates that “the museum will be ready to operate fully with all its exhibitions in the spring of 2020”. “The exhibition of sculptures will take place in 2018 and in 2019, the exhibition ‘set up’ in the large exhibition space will be temporary, giving the museum an opportunity to renew itself at regular intervals and the public to be exposed to various finds and themes, thus keeping its interest unflagging” notes the Ephorate’s head. She ends by describing as significant the increase in both European and national funding which, as she says, adds momentum to all work accomplished in the region.